Total dietary fiber intake should be 25 to 30 grams a day from food, not supplements. Currently, dietary fiber intakes among adults in the United States average about 15 grams a day. That’s about half the recommended amount. Fiber is only found in plant food. Higher baseline consumption of energy-adjusted total fiber, breads/cereal fiber, and fruit fiber were all associated with a greater likelihood of aging successfully. … In contrast, a reduced likelihood of aging successfully … was observed among participants whose consumption of dietary breads/cereal fiber and fruit fiber remained consistently below the median during the 10 years. Conclusions: Consumption of dietary fiber from breads/cereals and fruits independently influenced the likelihood of aging successfully over 10 years. These findings suggest that increasing intake of fiber-rich foods could be a successful strategy in reaching old age disease free and fully functional. – They did not find a benefit from vegetables. 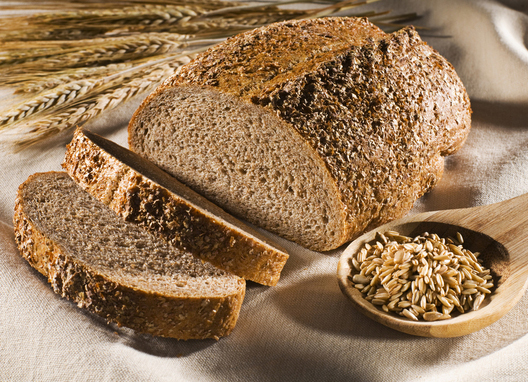 – The fiber from breads/cereals came mostly from rolled oats and wholegrain breads. – As to mechanisms, they said dietary fiber could reduce inflammation. Moreover, it was proposed that short-chain fatty acids produced by fermentation of dietary fiber by intestinal microbiota interact with the anti-inflammatory chemoattractant receptor GPR43. One of the short-chain fatty acids is butyrate. Remember butyrate? The man (or institution) that wrote the book, Fat Is Our Friend, said to eat butter because it contains butyrate. After I pointed out that butyrate is broken down and absorbed well before it reaches the colon, a fact he finally agreed with, he said to take a butter enema. For crying out loud. This entry was posted in Uncategorized on June 26, 2016 by Bix. Any idea why it was only grains and fruits, not veggies? I don’t know. They did say that fiber could just be a marker for other chemicals that go along with fiber. In the case of grains, there could be resistant starch feeding colonic bacteria, making short-chain fatty acids, etc. – Cranberry juice reducing urinary tract infections. – Tart cherry juice reducing blood pressure.